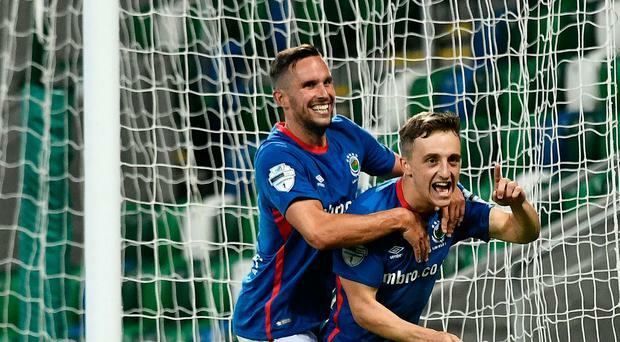 Joel Cooper stole the show as David Healy's Linfield swatted away the challenge of Danske Bank Premiership new boys Institute at Windsor Park. The 22-year-old, snapped up from Glenavon over the summer, was the tormentor in chief as the Blues racked up their second win in a week, which takes them to the top of the table. Andy Waterworth shot the Blues into a first-half lead, but they really put their foot on the gas after the break. Goals from Chris Casement and Cooper sent the sizeable home support home happy. Blues boss Healy named the same team that pocketed full points from the opening day visit to Glenavon, while his opposite number Paddy McLaughlin made only one alteration to the side that made a winning start by beating Newry City at the Brandywell, drafting in Ronan Doherty for his debut in place of Stephen Curry. As expected, it was one-way traffic, with Institute, stringing five players across the back, content to soak up everything the Blues could throw at them and, even though they spent most of the first half probing and teasing, they found the north west side a stubborn lot. It could have been different had Josh Robinson's clever touch to Matty Clarke's blockbuster found the net instead of stinging the hands of Marty Gallagher after only six minutes. Robinson's defensive colleague Jimmy Callacher was next to try his luck with a towering header following Kirk Millar's corner, but his effort flashed over. The tricky Cooper was then flattened by Ryan Morrow on 18 minutes. Free-kick specialist Millar played a short pass to Niall Quinn, whose shot arrowed over. Linfield were right out of luck on 24 minutes. This time Quinn's corner was met by Callacher, who saw his header come off the lurking Waterworth. Caoimhin Bonner managed to hoof clear but only to Casement, who blasted over the crossbar. Institute produced their only attacking threat on the half-hour. Aaron Harkin's free-kick caught the Blues defence napping, leaving the usually lethal Michael McCrudden with a sight of goal, but his first-time effort failed to hit the target. They were made to pay for that miss as the Blues surged ahead seconds later. It was a textbook build-up involving Millar and Casement, who fired in a low cross that was gobbled up by Waterworth, and his first-time drive ballooned the net before Gallagher could even move. The big striker almost did it again, this time picking up a pass from the impressive Daniel Kearns, but Bonner managed to get a telling touch to deflect the ball inches past the post. It was almost lights out for Institute in first-half injury-time when Doherty hauled down the jet-heeled Cooper on the edge of the penalty box. Casement stepped up to ram the free-kick against the base of the post. Linfield roared from the traps after the restart with Cooper sending Millar away. After cutting inside defender Colm McLaughlin, he fired in a shot that had Gallagher at full stretch. But the home fans were celebrating again on 59 minutes. Kearns' clever back-heel sent Cooper free on the left and his low cross was drilled home by the in-rushing Casement. Suddenly it was party time, especially when the Blues struck again on 66 minutes. Quinn's delicious free-kick, whipped in from the right, found Cooper and, with a flick of his head, the little midfielder sent the ball past Gallagher. Cooper then tried his luck with an audacious 30-yard shot that Gallagher was relieved to see go over, and the Blues saw the game out.